At our double dual meet with Mission Bay and Madison on May 3rd 2018, Victoria Perez broke both the Shot Put and Discus records. Later, at the CIF Finals, she extended her shot put record out to 34' 7". Her discus throw of 119' 2" remains as the new school record. 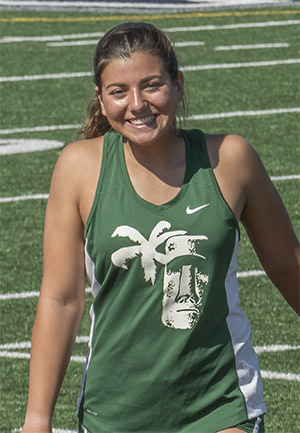 She was our only female thrower in 2018.She won all our dual meets for both shot and discus, including the league finals where she was the league champ in both events. Click here for 2018 Girls San Diego Section Win in 2018. 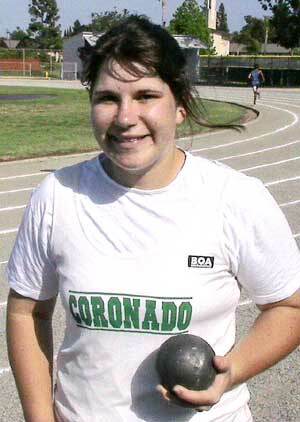 Kara Solem had come close to the shot put record several times during her senior year and at the Madison dual meet in 2002 it all came together for her. Actually she broke the record three times that day with the her best throw nearly out to the 33 foot mark. Because she exceeded both the 4-kilogram and 8-pound records her throw removed the asterisk from this event (see below). 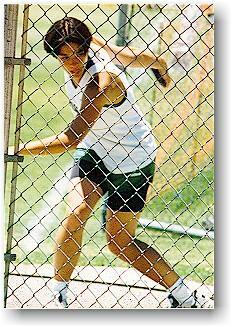 When the girls shot put weight was raised from 8 pounds to 4 kilograms (about 8#-13oz.) the girls shot put record had to be started over at the new weight. I don't have a record of who set the initial mark but it may have been Vanessa Bowman. She threw 32' 3" with the new weight. Since this was 6 inches shorter than Moe Carr threw in 1980 with an 8 pound shot both records were maintained at that time. In 2002 Kara Solem exceeded both marks (see above). Vanessa is shown the left with miler Jessica Lunt and to the right throwing the discus. 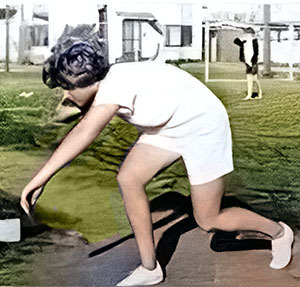 Moe Carr set the "modern" 8 pound version of the record at 32' 9" in 1980 and she held the discus record until 2018 when Victoria Perez broke it. The photo to the left is from her senior photo in the year book, the one to the right from the cross country page. Yes, Virginia, sometimes shot putters run. 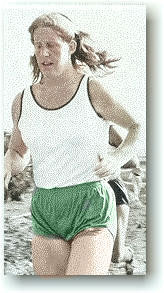 Finally we have Cheryl Anderson from the Girls Individual teams of the early 60's. The photo was taken from the 1964 yearbook before girls track became an official CIF sport. 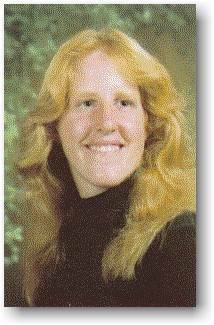 Cheryl put the shot 36' 3" that year. However, I don't know the weight of the implement.